I read this article and found it very interesting, thought it might be something for you. The article is called Pune’s Dependence On Octroi & New Constructions and is located at https://archive.indiaspend.com/sectors/economy-policy/punes-dependence-on-octroi-new-constructions-28395. Pune city, the second largest in Maharashtra after Mumbai, was once considered a getaway retreat for retired Mumbaikars. That’s no longer the case though, with Pune, like many of its ilk, witnessing unprecedented growth and expansion in recent years. And has attracted new industries like information technology, in addition to a successful automotive cluster. Pune earns its income in much the same way as before though. Octroi, a tax levied on goods brought into the city, still forms the largest chunk of the city’s revenue. Followed by licenses for new buildings. Not surprising perhaps, Pune has been witnessing a construction frenzy like never before, for more than a decade now. 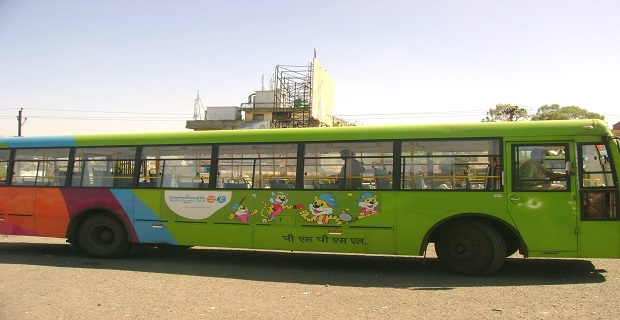 But Pune has also opted for local body tax (LBT) that will replace octroi and also potentially involve less hassles. Mumbai has been trying to move towards LBT but has faced incredible resistance from many quarters. It’s not clear what the move from octroi to LBT will do to the city’s finances or how but it might be instructive to understand them better. Incidentally, very few cities in India actually have octroi. Pune is the eighth largest in the country with a population of 3.1 million and its civic affairs are managed by Pune Municipal Corporation (PMC), which is expected to report total revenue of over Rs 4,100 crore in 2013-14. The 28% increase expected in revenue from Rs 3,247 crore in 2011-12 to Rs 4,167 crore in 2013-14 will be mainly driven by the increases in octroi and building permits. Octroi income is expected to increase from Rs 1,235 crore in 2011-12 to Rs 1,657crore in 2013-14, an increase of 34%. Income from building permissions is expected to increase by 59% to Rs 701 crore from Rs 440 crore in 2011-12. An interesting fact is that Pune receives only 3% (Rs 124.24 crore) of its income as grant from the State and Central Government and an additional 5.4% (Rs 227.22 crore) under Jawaharlal Nehru National Urban Renewal Mission (JNNURM). The JNNURM is focused on improving efficiency of urban infrastructure, service delivery, community participation in the decision-making process and accountability & transparency. 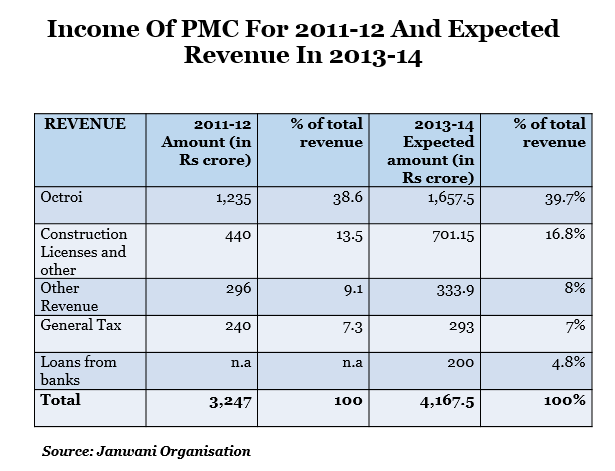 There will be a 24% decline in Government grants and 11% drop in JNNURM funds as well during 2013-14. This might be due to delays in existing projects. Another interesting facet has been the inclusion of bank loans (5%) as part of the income of PMC. Interesting because very few Tier II cities are even eligible for getting bank loans. 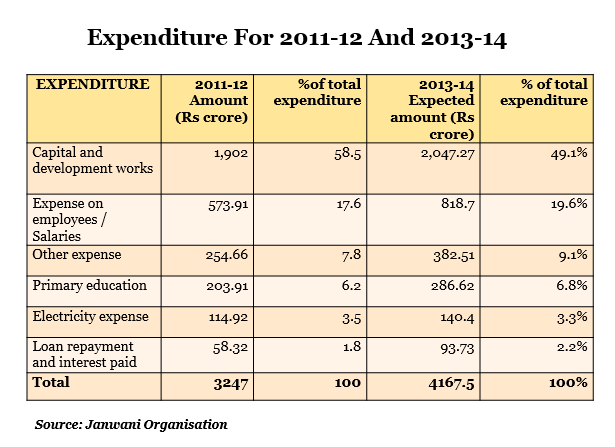 Let us now look at the expenditure for 2011-12 and 2013-14. The increase to Rs 4,167 crore from Rs 3,247 crore is most likely to be fuelled by the increase in capital expenditure and salaries. The highest increase in expenditure is expected to be for education (40%) and loan repayment (60%) but it is still a very small part of the entire budget as a whole with only 2.2% of the total expenditure. Capital expenditure is divided into development works like roads, bridges and flyovers, followed by water supply projects and sewerage projects. Most of the funds under capital expenditure are dedicated to capital & development-related projects. From the table above, it can be seen that capital expenditure, as a percentage of the total expenditure, is expected to come down from 58% in 2011-12 to 49% in 2013-14. At the same time, administrative cost is likely to go up from Rs 573 crore to Rs 818 crore (an increase of 42%) during the same time. An interesting observation has been the increasing loan and interest payments. With bank loans becoming a significant portion of the income of the Corporation, there has been a significant increase in interest and loan repayments. As a percentage of expenditure, it is expected to increase from 1.80% in 2011-12 to 2.25% in 2013-14. The amount is likely to increase from Rs 58.3 crore to Rs 93.73 crore – an increase of 60%. The city has so far managed to complete 4 of its 11 projects but managed to gain funds from the Central Government for JNNURM 2. Last year, the funds allocated for JNNURM was Rs 414 crore and this year it will drop to Rs 309 crore. The slow rate of completion of projects has been highlighted as one of the reasons for the reduction in funds received from the Centre and State Governments under JNNURM. The municipalities are seen as the last tier of the Government in urban areas, and hence are the final frontier of implementation. So, in a way, the PMC budget does not meet expectations with its focus mostly on roads and traffic control with just 13% going towards capital and development funds. The city also faces an acute water supply shortage in summer, mainly because of increasing population. And it receives water from 4 dams that are also used for irrigation of crops in the adjoining rural areas. On an average the city receives water supply for 4-6 hours a day in two shifts, but with variations from ward to ward. Some wards receive 24×7 supply of water. While the allocation for the water sector is 12% of the planned expenditure, most of the funds are likely to be used for repairs of existing lines. Sanitation lags too though almost 85% of households have individual toilets: approximately 24,000 properties in the city do not have access to toilets within walking distance. There are 103 open defecation spots in the city, used by approximately 8,500 to 9,000 people according to the PMC document submitted to the Ministry of Urban Development. But the sanitation budget is only 5.3% of the expenditure plan. 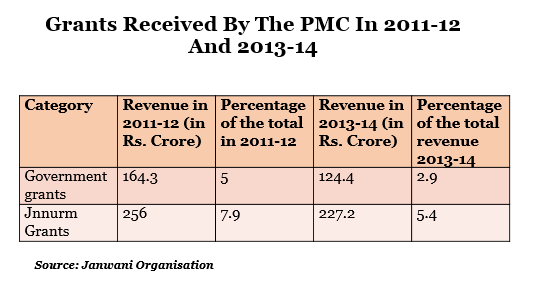 While the PMC is spending 50% of its revenue on capital and development work and only 20% on administrative expenses, it also shows that there are areas like water supply and sanitation that need shoring up as well.